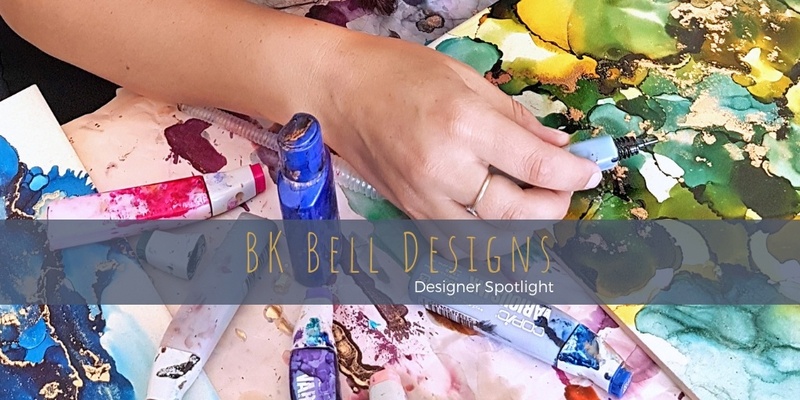 BK Bell Designs is all me - Belinda Radnidge. 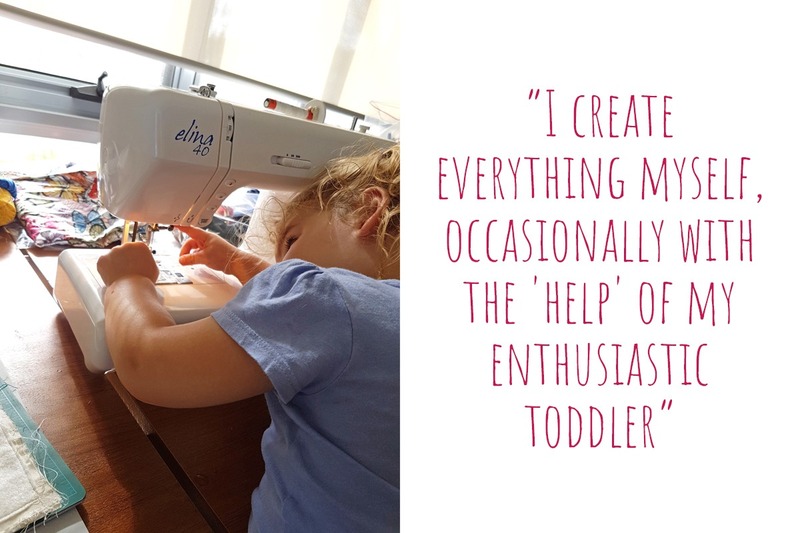 I create everything myself, occasionally with the 'help' of my enthusiastic toddler. I've been creating all my life, be it sewing, crochet, drawing, painting, jewellery making, cake decorating.... I'll try anything! Mostly for myself or gifts. I think every creative person has heard "you could sell this" from family and friends, so last year I took the plunge at going from hobby to business. I have a busy toddler, a day job as a psychologist, and a husband with a demanding job, so my creative pursuits usually happen after bedtime only. It's a nice bit of "me-time" at the end of the day, and a complete change of pace. I think it's important to have downtime activities that are creative or productive - the satisfaction and joy that comes from making something from nothing is unparalleled. I'm pretty lucky to have my sewing set up in our small living area, with half the room dedicated to my gear and the other half filled with our books. It's an evolving space, I'm ever looking for better organisational systems to keep all my fabric in check. Well, if I'm truthful, my husband is more worried about that than I am, the chaos doesn't bother me too much. My window looks out at a little strip of nature reserve over the road, and I'm quite happy to stare at the trees and flowers, and ignore the mess. My painting space is a little less glamorous - just a table set up in the garage, next to the washer, dryer and dog food! 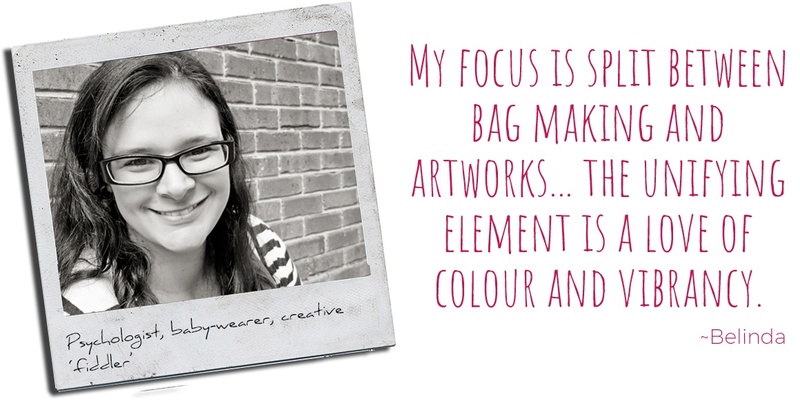 My focus is split between bag making and artworks, with sporadic bursts of jewellery as well. 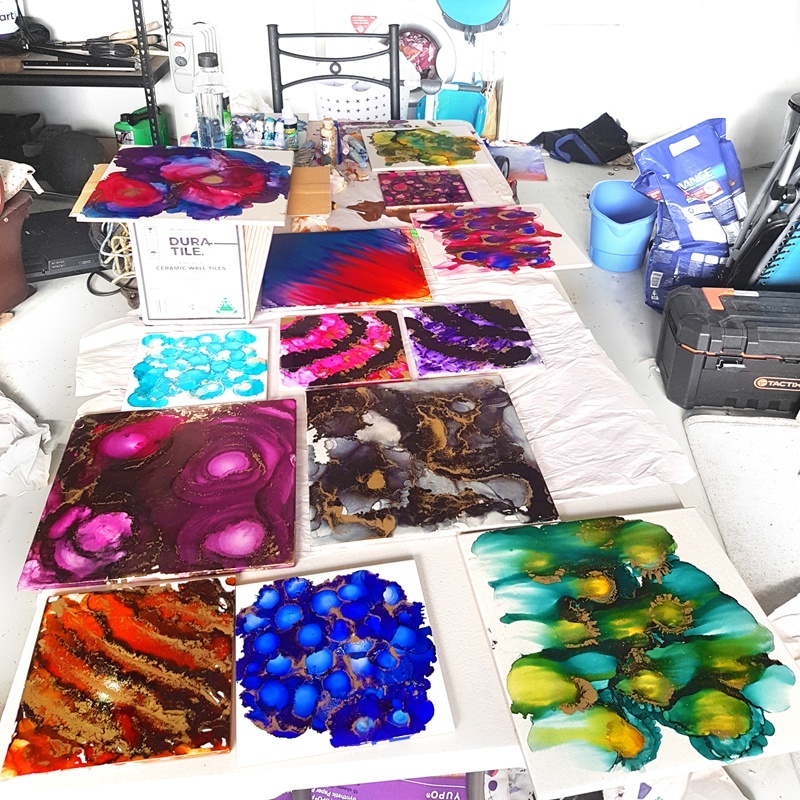 Sometimes people are surprised that I do it all, but for me the unifying element is a love of colour and vibrancy, and the desire to make something evocative and unique. 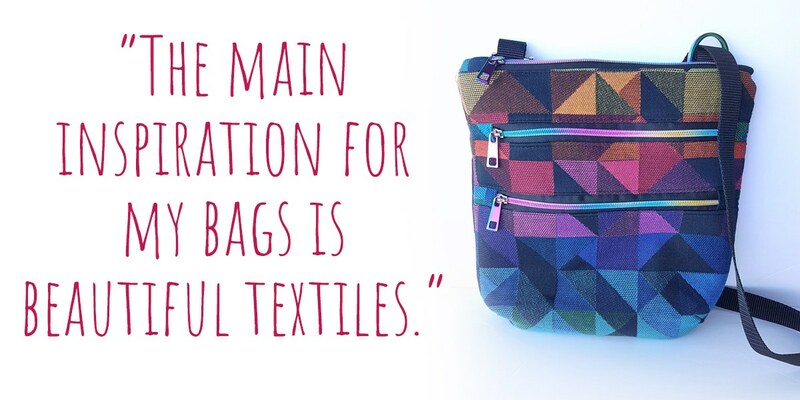 The main inspiration for my bags is beautiful textiles. I use a lot of woven wrap fabric, which is generally sourced either from the manufacturer or the second-hand market. The fabric is firstly beautiful, but also durable. It's usually jacquard woven fabric, meaning the design is woven into the fabric, and as its original purpose is supporting the weight of a child, woven wrap fabric is strong and robust, which is great for bags. 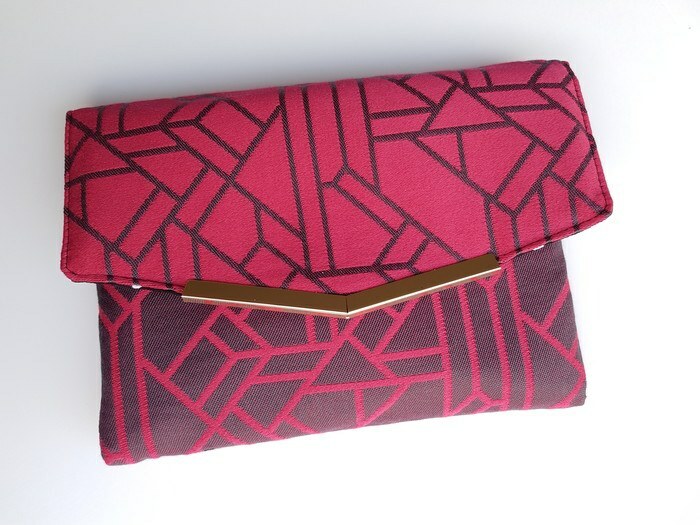 I love the unique fabrics and designs - most designs are released in limited numbers, and these are truly luxury textiles, so they are a bit different and special. And of course, in the world of baby wearing, woven wrap products are very sentimental. 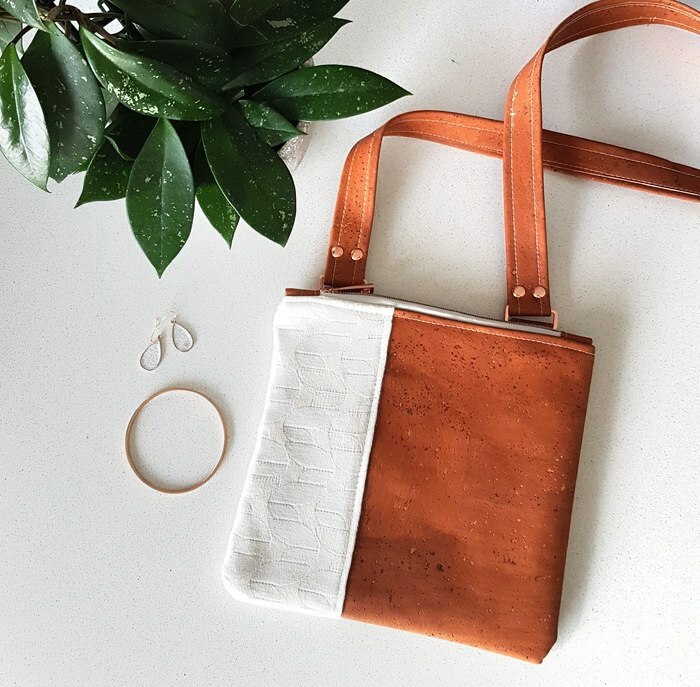 My other textile love is cork leather - this is a sustainable, eco-friendly textile made from the bark of cork trees to create a fabric similar in weight and qualities to leather. It's delicious to work with, and the sustainability is important to me. My artwork is a bit of a different story. 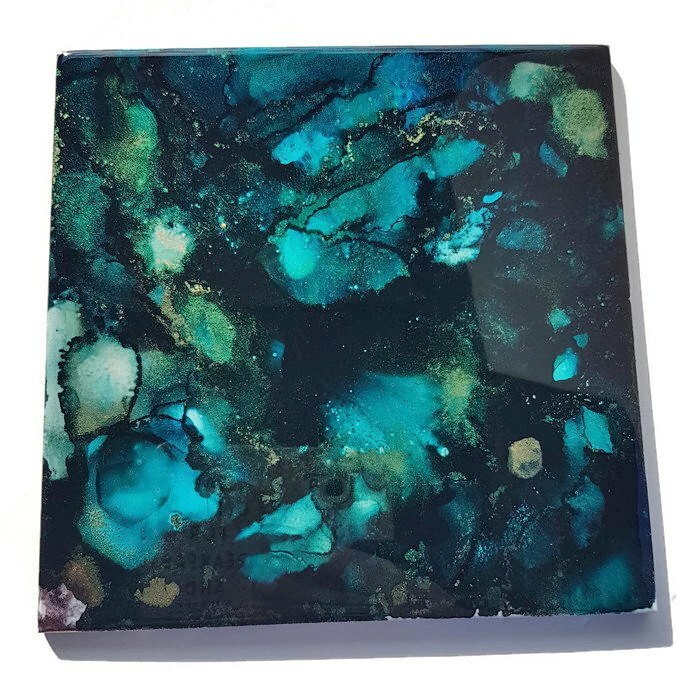 Working with alcohol ink is an endeavour in creative flexibility - I often pick out a couple of colours that I want to see together, sometimes with a clear idea in mind, but often not! 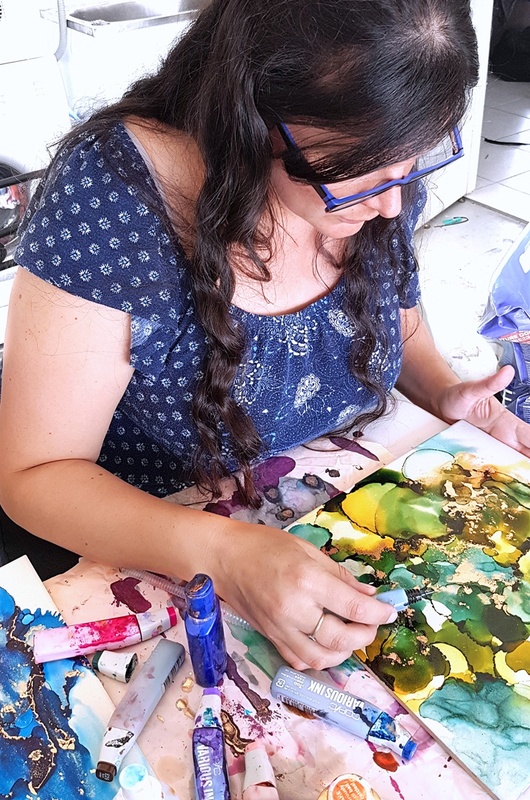 I usually go with the flow (pun absolutely intended) as I work, and a particular blend of colours, or fade, or particularly evocative shape with trigger an idea that shapes the next step in the work. 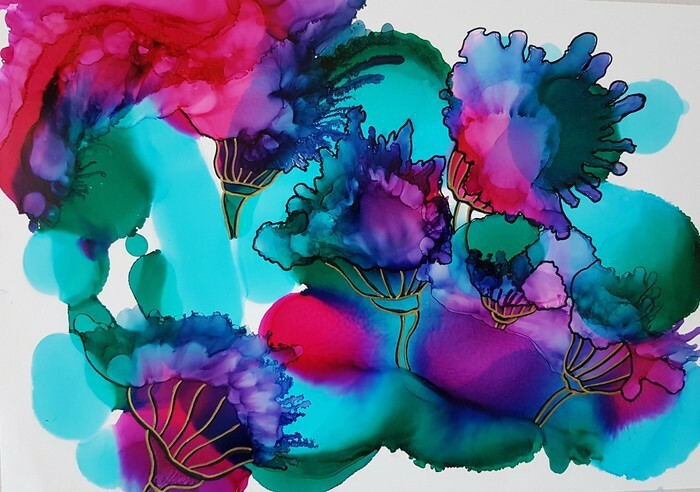 I'm drawn to natural shapes and often find myself thinking about flowers, plants, or water images as I layer colours and shapes in my pieces. I am completely in love with the vibrant/translucent quality of ink, above any other medium I've ever used. It seems filled with light and movement, which is a magical thing in a static artwork. I'm a fiddler. I've never been one to sit quietly and watch TV, I usually have something in my hands, something else to do - colouring, crochet, anything! So it's always been my habit to be making something in my down time. 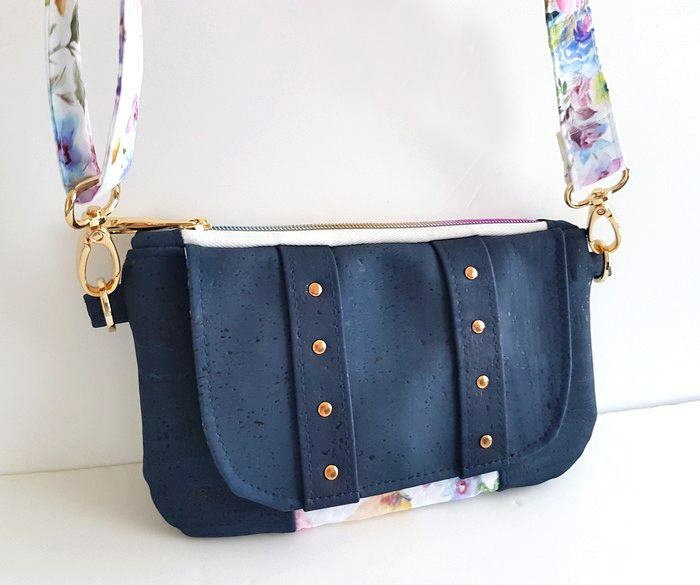 After I had my daughter, I entered into the baby wearing community and discovered the delightful textile world of woven wraps, and it was just a short jump to getting my hands on some and making something myself. 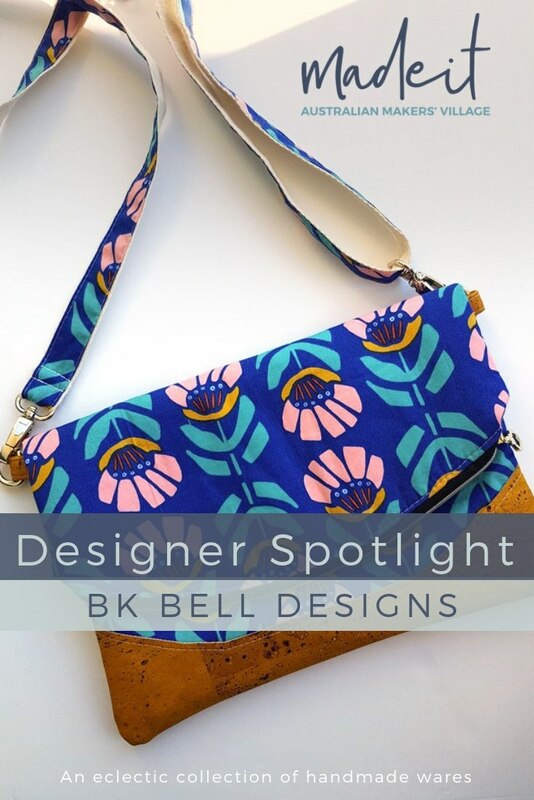 That was really the start of BK Bell Designs, as I started making and selling online to other baby wearers. Everything just cascaded from there. I'm so in love with Madeit! Having been selling online through social media and another online shopping platform, I've realised it's quite a big, lonely world out there! Since joining Madeit I've found a great sense of community and connection with other creators that I didn't expect. It's also very user friendly, and anything that makes my life a bit easier is a winner! It's been said before, but handmade is love. 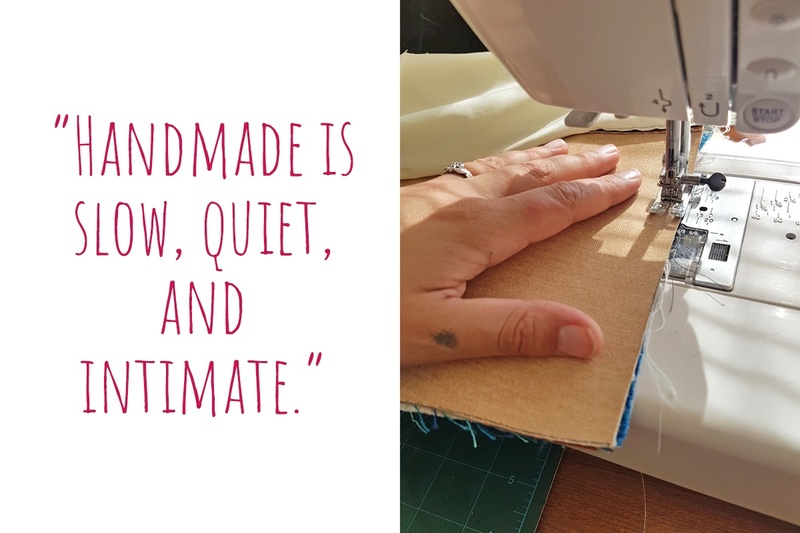 Handmade is slow, quiet, and intimate. For myself, I feel great delight in taking an idea and making it real. It's very satisfying, in a way that other activities aren't. There is so much dedication, skill, and energy that goes into a handmade product, it's special and different to mass produced goods. I'm not one to trash talk mass production - I'm confident I don't have the supreme skills and speed to work in a handbag factory! But I believe handmade products are also a way to call attention to the exploitation of labour in much mass production, since the time, cost and labour results in such dramatically different price points. We need to have conversations about mass production and local handmade products that is nuanced, that recognises skills and expertise that are often grossly undervalued in the world of mass production, and re-shape the way we think about creation, production and value.